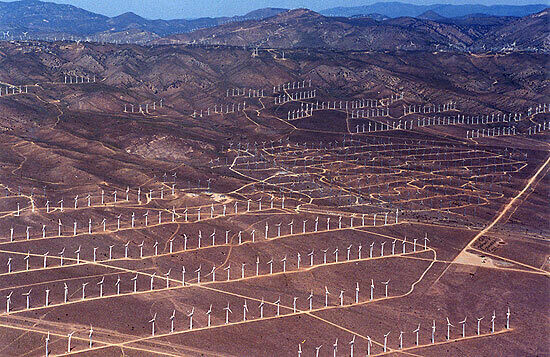 The Tehachapi Wind Farm, with around 4,731 wind turbines, is the second largest collection of wind generators in California (the largest is at the Altamont pass, near Livermore and the San Francisco Bay area). The turbines are operated by a dozen private companies, and collectively produce about 3,236 megawatts of electricity, enough to meet the residential needs of 350,000 people every year. With over 11,000 turbines in the state (4,029 at Altamont and 2,159 at San Gorgonio Pass, near Palm Springs), wind power in California makes up about 6.5% of California's electricity, as of 2014. Until just a few years ago, these three wind farms were the largest in the world.